Those who leave say, "I'll be back" for more burgers! - Their flame-broiled Angus Burgers, topped with Applewood smoked bacon, are the Studios' favorite, served underneath a mound of fries. - The Popcorn Shrimp basket, served with a spicy cocktail sauce and fries, is also worth coming back for. - BBQ Ribs, BBQ sandwiches, rotisserie chicken, cold beverages. 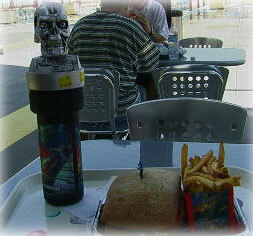 Part of the Terminator 2 3D building, this restaurant is closed in low season.